The camera slowly tracks up a steep drive toward a classic white wooden church. It lingers, and then pans upward toward gable and steeple, where it lingers again. This long establishing shot sets the tone for Paul Schrader’s deliberately paced First Reformed, and nearly every single drawn out frame of this film is exactly as it should be. First Reformed has drawn comparisons to Ingmar Bergman’s 1963 artistic masterpiece Winter Light. That may be a bit overstated, but it’s certainly Schrader’s best directorial effort since Affliction (1997) and is of the quality of auteur offerings from his heyday in the 1970s/80s such as The Comfort of Strangers, American Gigolo, and Mishima. The white frame church is a Dutch Reformed house of worship about to celebrate its 250th birthday. Although First Reformed was filmed in Queens, we imagine that its fictional setting of Snowbridge, New York lies somewhere in western New York’s “burned over” district where the evangelical fires of the Second Great Awakening reached white hot temperatures in the decades before the Civil War. No more. Although the First Reformed Church is solid, handsome, and somber, it’s also mostly empty in most senses of the word. It is spartan in its furnishings, houses a non-functioning organ, is devoid of frippery, and numbers a congregation of about a dozen. It keeps the lights on by peddling tours and trinkets to tourists and through the largess of a nearby super-church, Abundant Life. 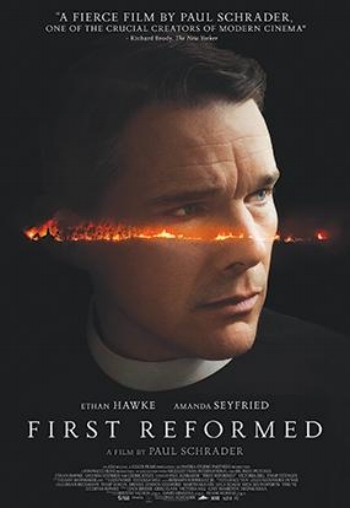 First Reformed’s pastor, Ernst Toller (Ethan Hawke), is like his church: quiet, stern, and emotionally empty. It’s the kind of posting for individuals who probably ought to be in therapy rather than the ministry, and Toller certainly has his demons. Like cinematographer Alexander Dynan’s camera work, Toller’s secrets come out slowly and obliquely. First Reformed is told largely from Toller’s point of view and even then, often via a voice over of the words he is writing into a journal into which he spills his thoughts every day for a year. It doesn’t take long to work out that Toller is a damaged ascetic. He’s a conflicted one, though, as he pores over texts by both Thomas Merton and G. K. Chesterton. Merton (1915-68) was a Trappist monk and mystic, and Chesterton (1874-1936), an eccentric lay theologian who was also a bon vivant, gourmand, and detective fiction writer. In other words, Toller is trying to work out the Christian dilemma of being in the world but not of the world—a maddening paradox that leads him to the borders of agnosticism. Toller’s austere lifestyle and beliefs stand in marked contrast to Abundant Life, where Pastor Joel Jeffers (Cedric the Entertainer) presides over a 5,000-seat church that’s a monument to wealth and worldly success. Toller has trouble processing Jeffers’ advice to lighten up and get with the times, just as he is confused by the (often unwanted) attention lavished upon him by Esther (Victoria Hill) Abundant Life’s choral director. But he is shaken to the core when pregnant Mary Mensana (Amanda Seyfried) asks Toller to counsel her husband Michael (Philip Ettinger), who is urging her to abort. Michael isn’t selfish by any means. He feels that it’s wrong to bring life into a world that is on the verge of becoming unlivable. As Toller digs deeper into the climate change data that has unhinged Michael, he finds himself unable to answer his penetrating question: “Can God forgive us for what we’ve done to this world?” Nor can he rationalize Pastor Jeffries’ advice to avoid controversy when he learns that his church’s big celebration is being underwritten by one of the country’s worst polluters. All of this sets the stage for anguish, contemplation, and actions that take unexpected twists and turns. Ethan Hawke gives the performance of his career thus far as Toler. His angular face embodies sternness and self-denial, and much of what he communicates on the screen is done through small physical movements and expressions. As befits his character, he is a man of few words. Hawke gives us a portrait of a man so inwardly torn apart that one wonders if the very filming of his part was torturous. There is buzz that he will be nominated for an Oscar for this film. It would be a travesty were he not to get one. This film is slow, but it packs a philosophical wallop. It is about the soul versus the senses on a microcosmic level, but on the macrocosmic, it’s about denial and spiritualism versus materialism and pleasure. Take note of how spare everything looks; Toller’s parish home and church are empty, but so is the Mensana home. Everything in Snowbridge is as bleak as the Superfund toxic waters along the town’s outskirts. Schrader also raises the question that sent Augustine of Hippo on his journey: Where is God? Is it significant that Seyfried’s character is named Mary? What are we to make a controversial segment that breaks the film’s tonal arc and ventures into something akin to magical realism? I’m not sure Schrader sticks the dismount in this film. He may have been aiming at something that was more developed in his mind than comes across on the screen, or he may have wished to leave big questions open. I suspect, though, that he thought himself into the unpainted corner of the room. I’ll leave that to you to sort out. I will say that this is a provocative film that will stay with you long after you leave the theater. It left me shattered. In a good way. I think. Postscript: I was shocked to learn that Paul Schrader has never been nominated for an Oscar of any sort. That should change. Now.